Note: After updating your nick’s gender or birthdate, your nickname will automatically be signed off Camfrog, and you may have to log back in. This is normal, and required for changes to take effect. 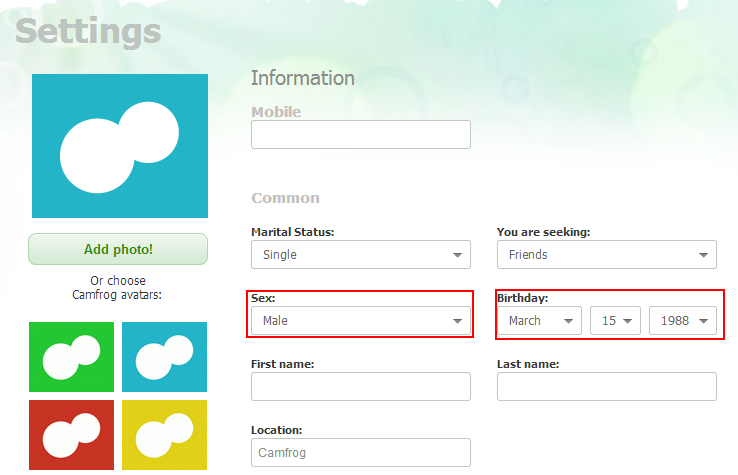 I agree with Birthday changing feature, but not with the gender one. My reason is simple: gender changing would generate chaotic situation in rooms due to “wrong gender” rule. Many would be so easily to abuse the feature and room operators would face a dilemma on running their room rule. I am sure you get my point on this, Frog. If I my suggest, put the gender changing feature “one time only”, not more! or better cancel it. good frog!! I am happy with this update … I have a question … until when we can turn this gender?? the limit is it there? anything went camfrog for all!! Yey!! Wow. Frog! I like that. But if can change gender more. i am not sure my friend me in contact list and user in room him is male or female? Fantastic features!!! One question: are those features for all age people or limited for certain age people? Many men now change the icon to a girl icon in the rooms. So that people think that there are many girls in the rooms. So if they want to change the icon then make like they can only change the icon 1 or 2 time or not at all. If they accidentally put in the wrong birthdate yes that i understand for to change that. I self think it was not a good idea to change the Icon. Personally what i think is that Camfrog should put a limit on the birthdate changes to 1 change only and that’s it no more changes after that. also adding a feature to verify your age, specially for the younger generation that use camfrog such as COPPA. where the person creating an account for camfrog would need to fill out a form and get parental consent, and sent the form to camfrog. and it would take an administrator to review the form to activate the account. A teenager can now change their date of birth to an 18+ account so they can join 18+ rooms. and any teenager that has changed their date of birth should have their account locked until proof of age is provided. such as a COPPA Form which would need to be Camfrog Verified. Under 18 users cannot change their birthdate. Likewise, adult users cannot change their age to appear under 18. Birth dates are easy, either they are correct or not. People who lie should be denied service.